If you’re interested in learning what Rhode Island offers to boaters, mark your calendar for May 4 & 5 and plan to spend the weekend traveling the coastline of the Ocean State at a unique, state-wide boat show. The Rhode Island Boat Show is a gathering of boats, equipment, and experts that takes place in five different venues, including Bristol, Jamestown, Middletown, Wakefield and Warwick. Attendees will have an opportunity to see new and brokerage boats, both on the water and on land; explore a range of Rhode Island marinas and service facilities; meet local vendors and experts; and get acquainted with beautiful coastline and scenic towns that may be new to you. “We want people to come to this boat show from throughout the region – to enjoy themselves and explore why Rhode Island should be their boating home,” said Wendy Mackie, CEO of the Rhode Island Marine Trades Association (RIMTA), which endorses the show. Many out-of-state individuals have already chosen the Ocean State as their boating homebase: approximately half of the 44,000 registered boaters in Rhode Island live in other states. They come to Rhode Island for its 400 miles of coastline, 300 harbors, and true diversity – from serene anchorages, to historic New England towns and villages, to bustling city waterfronts. Rhode Island also does not charge sales tax on boats that are built and registered in the state, and the no-sales-tax benefit applies as well to boating services such as refits, repairs, storage, mooring and berthing. The two-day Rhode Island Boat Show is a prime opportunity for those in the market for a new boat; for boat owners in search of berthing, winter storage, and refit options; for cruisers in search of new waypoints for this summer; and for those simply looking for a spring weekend of hanging around boats and boaters. According to Ryan Miller, owner of Latitude Yacht Brokerage in Newport and one of the founders of the boat show, this event started in 2011 with one venue. It was a time when the country was climbing out of a recession and the marine industry was getting back on course. “The event was simply a way to say, ‘We are open for business,’” said Miller. Organizers designed a show that was user-friendly for both attendees and the industry. There was no admission fee and free parking for attendees, a policy that has continued. For the industry, the show was easy to get to; exhibiting did not require hauling boats and transporting them to a convention center, but simply sailing or motoring to the marina. In successive years, a good idea kept getting better. Last year, the event expanded to three venues. This year, there will be five. Bill Munger of Conanicut Marine Services remembers last year’s event as a weekend of glorious weather and enthusiastic attendees that had a ripple effect through the marina’s Jamestown home. “Our marina is right in the village,” he said, “and the show had a sunshine effect – not only for our operation but for the entire village. It was a spring kick-off to the season.” Conanicut includes a marina, chandlery, boatyard, yacht brokerage, and a staff of expert technicians. This year Munger plans to showcase the yard’s in-house expertise at the boat show, with technicians available for technical advice to showgoers. Beyond Block Island and Newport When sailing to Rhode Island, so many cruisers head straight for Block Island or Newport. 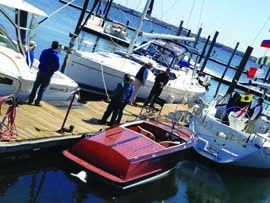 The Rhode Island Boat Show will give boaters an opportunity to see new parts of the state. In addition to the Jamestown location, head to the protected northwest corner of Bristol Harbor to see Bristol Marine and Fleet Yacht Sales. In addition to a world-class operation with highly trained technicians who handle everything from washing and waxing to electronics, woodworking and painting, the marina is a short distance from historic downtown Bristol. Lynn Fiorenzano at Silver Spring Marine in Wakefield is looking forward to introducing more people to her corner of Rhode Island during the show. “We have easy access to the ocean and the water here is clean, with great clamming, fishing, waterskiing, and other activities,” she said. The marina emphasizes family fun, for those with boats that fit the draft requirement of the area. And with a staff of well-trained technicians, Silver Spring has been both home and vacation destination for boaters from throughout the region; Hartford is a 1.5-hour drive away, and New London is only 40 minutes. To reach the Warwick venue, head to Marinemax and the 1,100-slip Brewer Greenwich Bay Marina; Brewer is also hosting its own open house the previous weekend. West Marine in Middletown, the fifth venue, will feature trailerable boats. There is no admission fee for the Rhode Island Boat Show. Simply mark your calendar and get ready to explore. For the latest on the show, visit the boat show’s website (rhodeislandboatshow.com), which will list the boats on view at each venue, and connect with the event via Facebook. Once you arrive at the show, you’ll be rewarded with the kind of one-onone time with exhibitors that is hard to get at large, single-venue shows. And in the process, you just may find a new corner of Rhode Island to call your boating home.